NEWTOWN SQUARE, Penn. (March 12, 2018) – Homes and forests intersect in the wildland-urban interface, or WUI, a geography that now includes one-third of all homes in the United States within just 10 percent of the nation's land area. For the first time, scientists with the USDA Forest Service and the University of Wisconsin-Madison have been able to track change in the nation's WUI over a 20-year period, revealing that new WUI area expanded by more than 46 million acres, an area that is larger than Washington State. Both the number of homes in the WUI and total footprint of the WUI are growing rapidly, and this expansion has many implications for wildfire management and other natural resource management issues. Miranda Mockrin, a scientist with the USDA Forest Service's Northern Research Station, is a co-author of the study with lead author Volker Radeloff of the University of Wisconsin-Madison. The study, "Rapid growth of the U.S. Wildland Urban Interface raises wildfire risk," was published March 12 in the journal Proceedings of the National Academy of Sciences. Wildland-urban interface is an area close to or intermingled with forests and grasslands, with at least one home per 40 acres. Scientists distinguish between "intermix" WUI, in which housing and vegetation intermingle, and "interface" WUI, where housing is near a large area of wildland vegetation. 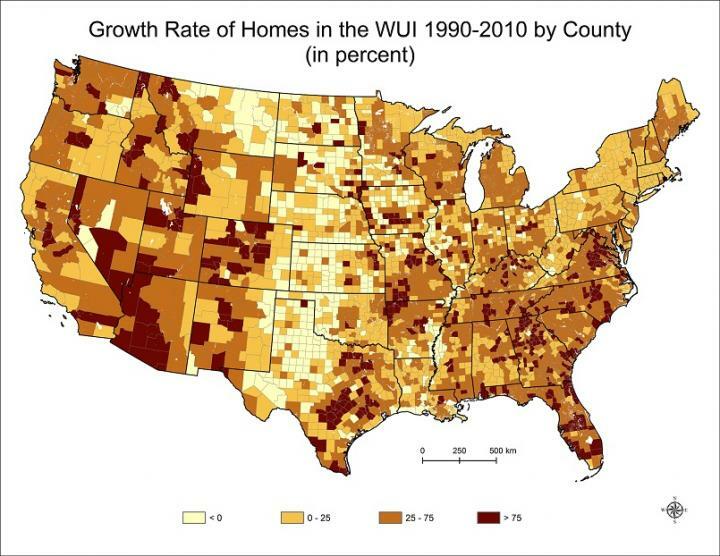 From 1990 to 2010, the WUI grew rapidly, increasing from 30.8 to 43.4 million homes (41 percent growth) and expanding in area from 143,568,227 acres to 190,271,144 acres in area, or 33 percent. The vast majority of new WUI areas were caused by new housing (97 percent), not an increase in wildland vegetation. "An expanding wildland-urban interface has broad impacts on natural resource management, and poses particular challenges for wildfire management," said Tony Ferguson, Director of the Northern Research Station and the Forest Products Laboratory. "WUI data and maps produced by the USDA Forest Service and all of our partners in this research will be vital for counties and cities working to enhance the safety of citizens and the management of natural resources." The greatest expansion of WUI area occurred in the East, with the highest gains in houses and people in the WUI in the South and Southwest. The number of WUI homes increased by 70 percent or more in Nevada, Arizona, Florida, Utah, and Colorado over these two decades. The highest increases in WUI area were seen in Nevada, Utah, Colorado, Montana, and Idaho (all greater than 60 percent expansion in WUI area). "Our research demonstrates that the peace and beauty of natural settings have been consistently valued by homeowners over the past two decades," said Mockrin. "It is important for people to appreciate that this growth in housing among wildlands does come with costs for people and nature alike, including increasing wildfire risks, changes in invasive species, declines in native wildlife, and changing ecosystem processes." Research on the extent of the WUI and where people and nature are intersecting is essential for planning that can help reduce the risk of wildfire for residents and firefighters, and in order to conserve natural areas. "Knowing how the wildland-urban interface is growing, and why, is essential for the people making decisions on management and policy," said Radeloff. Co-authors with Radeloff and Mockrin include David P. Helmers, Anu H. Kramer, Patricia M. Alexandre, Susan Stewart, and Sebastián Martinuzzi of the University of Wisconsin-Madison; Avi Bar-Massada of the University of Haifa; Van Butsic of University of California – Berkeley; Todd J. Hawbaker of the U.S. Geological Survey; and Alexandra D. Syphard of the Conservation Biology Institute.